Virtual server with Ubuntu 16.04 & ISPConfig3.1, to replace older seeds4c.org with Ubuntu 14.04. 4Gb RAM (aprox), 8 cpu, 50 Gb hard drive (+ 50Gb free to expand where needed with LVM). In Ubuntu 16.04, there seems no need to change locales manually, they are already changed in the previous step automagically. I ens respon ens18 en el cas de la vm111 - seed11. Then reboot the container or issue ifup eth0. However it seems that apparmor is not installed by default so far. So nothing to do. 0 actualitzats, 0 nous a instaŀlar, 0 a suprimir i 0 no actualitzats. Local time is now:      dc jun 11 09:25:53 CEST 2014. Universal Time is now:  Wed Jun 11 07:25:53 UTC 2014. To ensure that the server can not be attacked trough the HTTPOXY vulnerability, I will disable the HTTP_PROXY header in apache globally. APCu is a free PHP opcode cacher for caching and optimizing PHP intermediate code. It is strongly recommended to have one of these installed to speed up your PHP page. It is possible to have multiple PHP versions on one server (selectable through ISPConfig) which can be run through FastCGI and PHP-FPM. To learn how to build additional PHP versions (PHP-FPM and FastCGI) and how to configure ISPConfig, please check this tutorial: How To Use Multiple PHP Versions (PHP-FPM & FastCGI) With ISPConfig 3 (Ubuntu 12.10) (works for Ubuntu 16.04 as well). In this step we will install HHVM with apt. HHVM is a fast PHP engine developed by Facebook. ISPConfig 3.1 has builtin support for the free SSL Certificate Authority Let's encrypt. The Let's Encrypt function allows you to create free SSL Certificates for your website in ISPConfig. 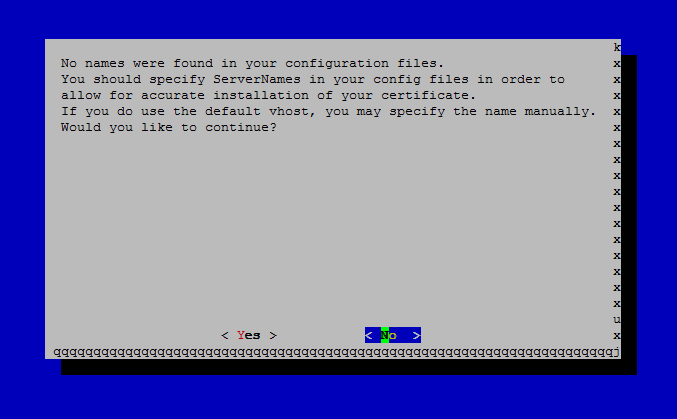 The command will then tell you that "no names were found in your configuration files" and asks if it shall continue, please chose "no" here as the certs will be created by ISPConfig. I seem to have avoided the issue by means of installing some extra packages (See below). I did not get the letsencrypt certificates created by ispconfig (maybe some issue was there since I migrated the ispconfig from a ubuntu 14.04 server to a new one with 16.04?). I seemed to have avoided the issue by means of running manually the /opt/certbot/certbot-auto and accepting to choose the domains/sites for which I wanted the certificates created. I Skip the following part of editing fstab since I will not be using quota to avoid issues in dimensis backup system. I had to install the mysql user roundcube with the password indicated in the config php files on disk. Afterward you can access ISPConfig 3 under http(s)://server1.example.com:8080/ or http(s)://192.168.1.100:8080/ (HTTP or HTTPS depends on what you chose during installation). Log in with the username admin and the password admin (you should change the default password after your first login). Enter the MySQL / MariaDB root password when requested. It started to work once I had updated all domains to use the new ip, and changed the hostname from seed11.seeds4c.org to the equivalent name as in the old server: system.seeds4c.org. Oct 12 02:40:53 seed11 sendemail: ERROR => Exiting. No recipients were accepted for delivery by the mail server. Sure and please, do not hesitate if you have other questions! - Click on the 'Save' button. If you add SVN to the default setting, the line should now read '/usr/bin/groups /usr/bin/id /usr/bin/dircolors /bin/basename /usr/bin/dirname /usr/bin/nano /usr/bin/svn'. New sites are associated with clients, and some ssh users can be created associated with that client and site. 1) Install a SSH daemon that supports chrooting. 3) Every newly created or updated user is chrooted by ISPConfig. ISPConfig runs the script /root/ispconfig/scripts/shell/create_chroot_env.sh automatically to copy the needed binaries and dependencies to the chroot enviroment. The file ld-linux.so.2 isn't being copied into the chrooted lib/ when new users are created. Without it, bash fails. There are actually two libraries that bash requires which are not copied over for some reason. They ARE listed in ldd so I don't know why they don't copy. PHP-FCGI is the default PHP mode used in ISPConfig3 admin panels. But you can change it to other PHP modes if desired. We'll show how to fix some usual errors with some of them. You might want to use another PHP mode for your website. For instance, PHP-FPM (FastCGI Process Manager), which is an alternative PHP FastCGI implementation with some additional features useful for sites of any size, especially busier sites..
As indicated here, Suphp, by default, won't allow any scripts to run with a user or group ID under 100. Since Tiki has all its files installed owned by the user www-data (UID 33) when it's installed, this poses quite a problem. One solution is to set the min_uid and min_gid values in the suphp config file to 33 which allows the scripts to run as www-data. Restart Apache, and you'll be able to replace files in file galleries again. Change perms on site-library from R to allow users to install packages there system wide. Fet, abans de remenar res de configuració, ni instal·lar cap "control panel", etc. root@seeds4c:/var/www/clients/client1/web2/web/# svn checkout https://svn.code.sf.net/p/tikiwiki/code/branches/12.x . mods ... Creating directory ok.
temp/unified-index ... Creating directory ok.
Change user to web8 and group to client3... done. Fix normal dirs ... done. Fix special dirs ... done. The force option is needed since the destination folder already exists. And the svn export is preferred (if no svn is needed) because of the space savings reducing it down to aprox. 40% of the initial size on disk (453 Mb for the svn-enabled version of tiki09svn, 181 Mb for the non-svn-enabled version). For some reason I can't understand yet, after some months of activity with ISPCOnfig3, some web folders become immutable. How does it affect the multitiki installations in a ISPConfig-powered server? After everything was installed, I tried sending emails from the command line. No empro tasksel sino apt-get install de paquets a ma. Instal·lo PluginR, i aplico els perfils r_test, i R_Heatmaps sense massa problemes. Després d'aplicar el de R_Heatmaps, sembla que falla el mostrar pàgina inicial amb url curtes. Faig els retocs habituals en .htaccess del tiki root. The requested URL /tiki9/HeatMaps was not found on this server. I ja que hi soc faig alguns canvis més en aquest .htaccess per a millorar el funcionament de Tiki. Logwatch is a modular log analyser that runs every night and mails you the results. It can also be run from command line.The output is by service and you can limit the output to one particular service. The subscripts which are responsible for the output, mostly convert the raw log lines in structured format. Once you have installed Logwatch (sudo apt-get install logwatch), you will need to configure it to email you the reports it generates. You are encouraged to look through the entire configuration, but you may safely use Logwatch after editing the lines below. These directives tell Logwatch to email you reports in an HTML format. The MailTo and MailFrom directives should be valid email addresses. Once you have issued this command, you will need to check your email to make sure that logwatch is working. Be sure to check your spam folder as these emails may be seen as spam. Congratulations! You can now monitor system logs with Logwatch! so somethig more will have to be done, in order to have sec monitor all of them. If some sec processes are running and you want to change them (delete old ones, and re-send new sec processes, you need to manually kill the old (perl) processes that were linked to the sec program. Identify which perl processes are not related to this sec job (if any), and kill the rest with "kill -9 pid", being pid the number shown at the left of the perl processes as shown by the output of the command "sudo ps -e | grep perl"
This script works fine while it's in memory. But when you reboot the machine, the perl command is not re-run bu default. So that you need to add it in the right place to have it re reun at each new boot or re-boot. Edit /etc/rc.local and add your command as shown above. Put your script in /etc/rc0.d. The name of your script must begin with K99 to run at the right time, since the scripts in this directory are executed in alphabetical order. Note that: The scripts in this directory are executed in alphabetical order. The name of your script must begin with K99 to run at the right time. Apache is used to show the Munin pages, the apache fcgid module is required for the Munin graph zoom feature. I will install apache and the libapache2-mod-fcgid module with apt. Once the package is installed, and those extra plugins enabled, you only need to make a few changes to get your installation working. Now wait a few minutes so that Munin can produce its first output, and then go to http://www.example.com/munin/ in your browser, and you see the first statistics. However, since we use to have tiki sites in the base domains, which prevent through .htaccess some features needed by munin, we will need to create a subdomain for munin. It may (usually) take a few minutes until the new domain is propagated across dns servers worldwide. Then you will be able to see the standard screen in your new domain munin.seeds4c.org when the domain is propagated. We can then replace the web folder from that site with a symlink to the www folder of munin in the server. We need to know which client and web number ispconfig assigned to this domain munin.seeds.org. In our case, it was client1 web44. Now it is a good idea to password-protect the munin output directory unless you want everybody to be able to see every little statistic about your server. Munin can easily monitor multiple servers at once. Let's add another server to be monitored by this one. For instance, precarios.org. We connect through ssh to precarios as user with sudo perms. (replace 172.30.2.100 with the real ip of your server, the one from munin.seeds4c.org, in this case, and replace 95.23.18.40 with the ip from your adsl or work, so that you can check from your desktop computer that the server-status page produces the expected output). However, in our case, it didn't work because the .htaccess from Tiki was overruling with its rewrite rules, saying that that wiki page didn't exist. Therefore, one workaround for this type of setup with ISPConfig server and a Tiki site in the main website, is to access the server-status information from another website in the same server. For instance: http://piwik.seeds4c.org/server-status worked, while http://seeds4c.org/server-status or http://localhost/server-status with a wget from console server-side didn't work. #   start program = "/etc/init.d/proftpd start"
#   stop program  = "/etc/init.d/proftpd stop"
start program = "/etc/init.d/amavis start"
stop  program = "/etc/init.d/amavis stop"
Replace /path/to/piwik with the path to your Piwik installation (which in seeds4c it's at /var/www/clients/client1/web20/web/ ). And finally, if you are using the GeoLite City database there is one more thing you need to do. The PECL extension won’t recognize the database if it’s named GeoLiteCity.dat so make sure it is named GeoIPCity.dat (piwik 2.11.1 did that renaming automagically for me). Restart the webserver and the GeoIP extension should now be loaded and working in Piwik > Settings > Geolocation. We need to tweak a bit that file, the first lines, until the line starting with header. ## Here is a custom example for .cf files like the ones from postfix configuration. Now we can test that it works! For some reason, as of 2017, letsencrypt renewals stopped to work in seeds4c.org server. I presume that some update to ISPConfig restricted access to .well-known/acme-challenge/, because certs could be created and renewed during 2016 in this sever, as far as I remember, and they could not be renewed anymore with the same commands at some point during 2017. AS of 2018-02-17, I discovered a way to avoid the issue, and let letsencrypt renew again its onw certificates in my seeds4c.org server. First remove any leftover temporary files from previous kernel updates. Determine the version number of the currently running kernel, which you DO NOT want to remove. 3. Clean up what's making apt grumpy about a partial install. Run command to enable unattended upgrades. For Desktop Ubuntu 16.04, this is enabled by default.